It’s easy to forget that almost every film, video game, music video, and commercial starts off as a concept that’s fleshed out through text and art. Thanks to concept art, painting is still very much alive in the modern world we live in, with its grasp on culture possibly higher than ever before in history. If that’s the gigantic art industry you want to jump into then you’ll need the right software to help you bring your ideas to life. ArtRage is an affordable and powerful tool that’s worth considering. Stop! Get a graphics tablet first! Before showing any software to artists, I would feel guilty if I didn’t first suggest buying a graphics tablet. Drawing or painting with a computer mouse – or your finger if you’re using a touchpad – is slow and tedious, so a digital stylus (pen) is highly recommended. I use a Wacom Intuos3 Tablet that’s 6 by 8 inches, but there are plenty of other options on the market! You’ll immediately notice the extra control over details that it gives you on every brush stroke, and you’ll get more work accomplished in less time. For artists buying ArtRage Studio ($40) or ArtRage Studio Pro ($80), they both are offered in the following languages: English, French, German, Dutch, and Italian. The software manual is currently only offered in English and Italian but they’re working on more translations. Here are the system requirements for both of these versions of ArtRage: Windows XP, Vista, Windows 7, and Mac OSX 10.4 or later as long as it has an Intel processor. A screen resolution of 1024 x 768 is needed, as well as 512 MB of RAM. ArtRage 2.6 ($20) offers many more languages to its users, such as: English, French, German, Dutch, Italian, Spanish, Spanish (South America), Portuguese, Portuguese (Brazil), Greek, Turkish, and Russian. The manual for ArtRage 2.6 is currently written in English, French, German, Italian, and Turkish. Please note that it has slightly less demanding system requirements: Windows XP, Vista, or 7. MacOSX 10.3.9 or later. 800Mhz processor Intel/AMD. PPC G4/G5). 1024 x 768 screen size. 256MB Memory. There’s also an ArtRage App that’s available for $.99 on the iPad. 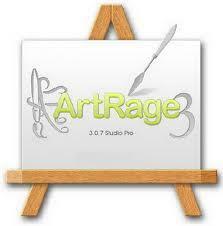 You can purchase any of the four ArtRage programs here. Oil brush, paint roller, paint tube, palette knife, watercolor brush, water glass, airbrush, and the ability to play with the thickness and wetness of paint so you can smear new brush strokes over old ones or even have the paintbrush’s texture leave marks on the paint as well. Drawing tools such as pencil, chalk, crayon, inking pen, felt pen, flood fill, and auto smoothing. Add complexity to scenes with sticker spray, sticker sheets, gloop pen, and glitter tube. Utility tools such as transformation tool, selection tool, and text tool. Not only is there a tool presets section to get you started, but there’s also a tool settings section to let you customize brushes exactly how you want. Color centric features such as custom color pickers, metallic tinting, and real color blending. Flexible stencil and ruler system that lets users make any shape a ruler, with many snap options. Shrink & expand pod based interface that’s customizable and compatible with mouse gestures. Other notable features include canvas presets, canvas properties, tracing images, automatic color selection, reference images, layers, layer groups, opacity, transparency preservation, blend modes, color adjustment, blur, Photoshop filters, and the ability to import and export Photoshop PSD files. To get a better idea of what these features and interface settings are like, you can preview some of them here in the ArtRage screenshots section. Before choosing which software version is right for you, feel free to check out the beginner and advanced tutorials as well as snoop through the ArtRage user gallery and community forums.